A few weeks ago, my traditional guild brought in guest speaker J. Michelle Watts to lecture and present a series of classes. I was fortunate enough to take a super fun day-long applique class with her. 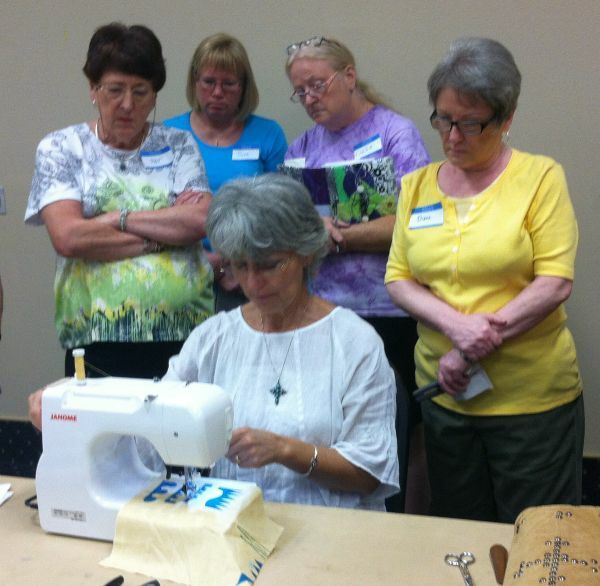 Quilting students watching J. Michelle Watts’ machine applique demo. 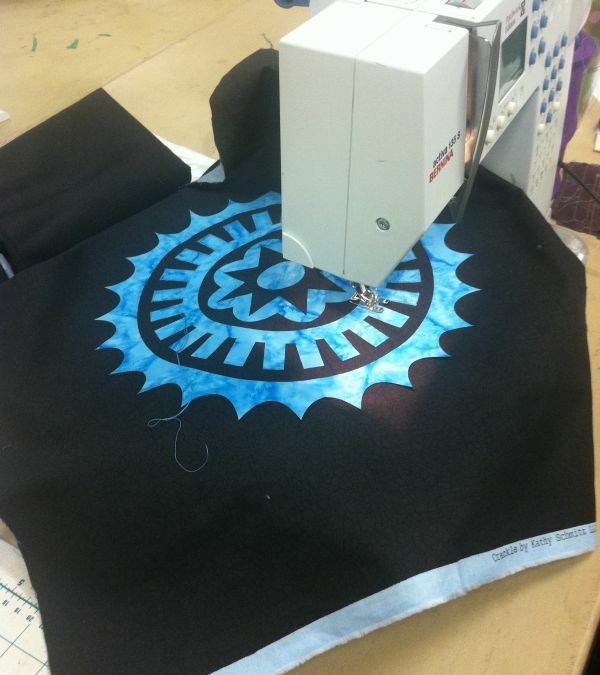 Michelle’s focus is on machine applique with a southwest theme and it was very interesting to me how many Southwest designs have a little bit of a geometric modern vibe to them. Some of Michelle’s beautiful class samples. As any well prepared teacher would do, Michelle offered kits available for our class and many of the students took her up on that offer. 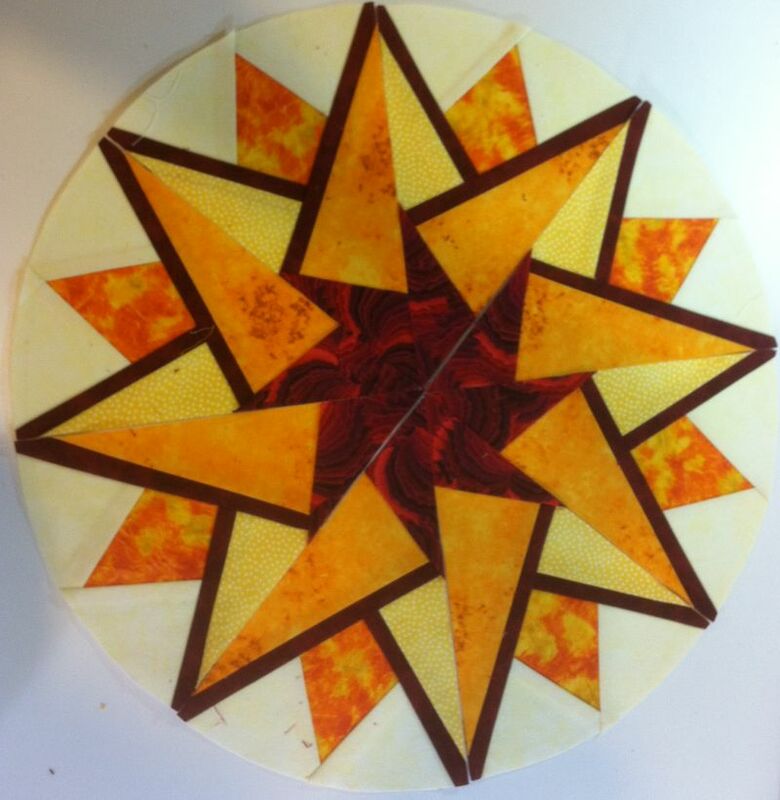 The medallion piece was a great exercise to practice stitching angular shapes, sharp points, and tight curves. My friend Cory stitched her practice sample on a striking black background. Of course, I had to go my own way and try something completely different! 🙂 I may not actually do anything with this piece, but it was fun to try out the teacher’s methods and pick up a few tips and tricks along the way. My version – it’s such fun to play! No matter how much I think I know about a particular subject, I always learn something new whenever I take a class. 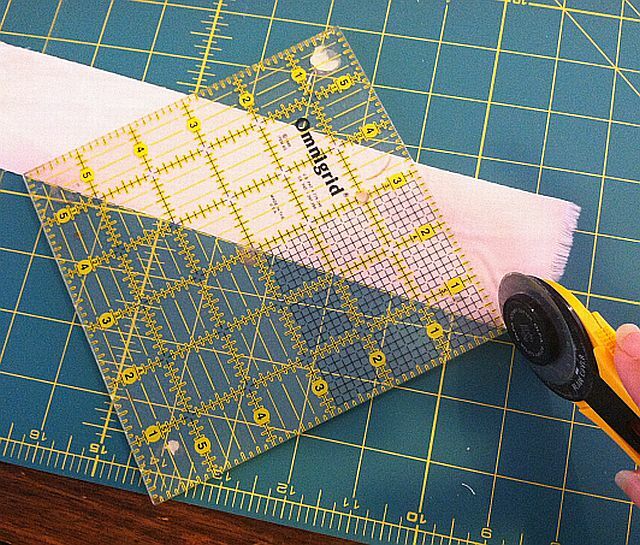 The best tip I picked up from Michelle’s class was to use a dotted outline when tracing shapes for fusible applique. It’s much quicker than drawing the whole line! Drawing dotted lines rather than a full outline of the shape is much faster! Thanks, Michelle, for a great day – and a fun class! 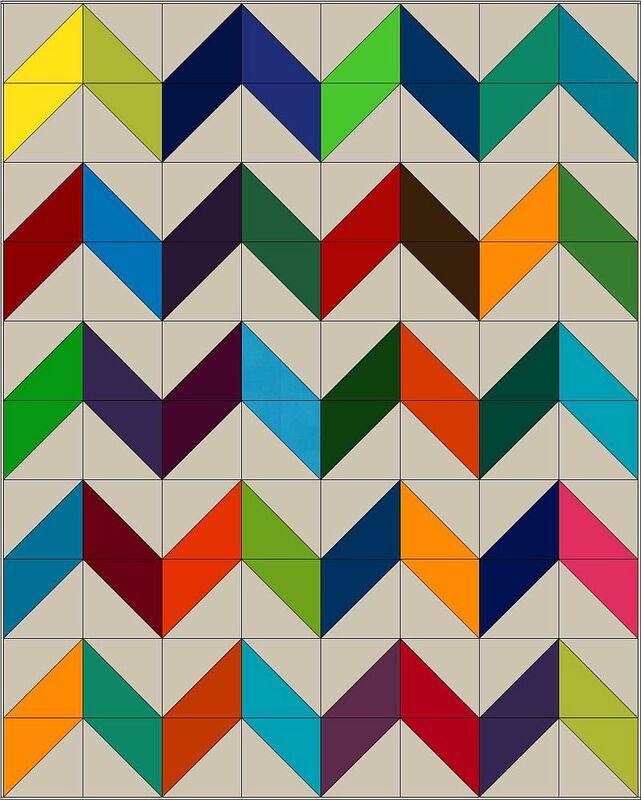 I am starting something new with my Charming Chevrons quilt-along. Each week or so I will post follow-up questions and answers the day after that week’s tutorial is posted. This will be so that I can answer any questions, or follow up on any suggestions while making your quilt. You can either ask your questions on any of my blog posts, or email me directly and I’ll answer them here on the blog. The first question is from JennyWren in Tx. She asked about which day will I be posting the weekly tutorials. That’s an easy one to answer! Usually on Wednesdays, depending on when I get that week’s step finished. My goal is to be about a week ahead of you guys but sometimes life gets in the way. If I get really behind, I’ll post no later than Thursday of that week, but I’ll really try to get it up as early on Wednesday morning as I can. How’s that for an answer? 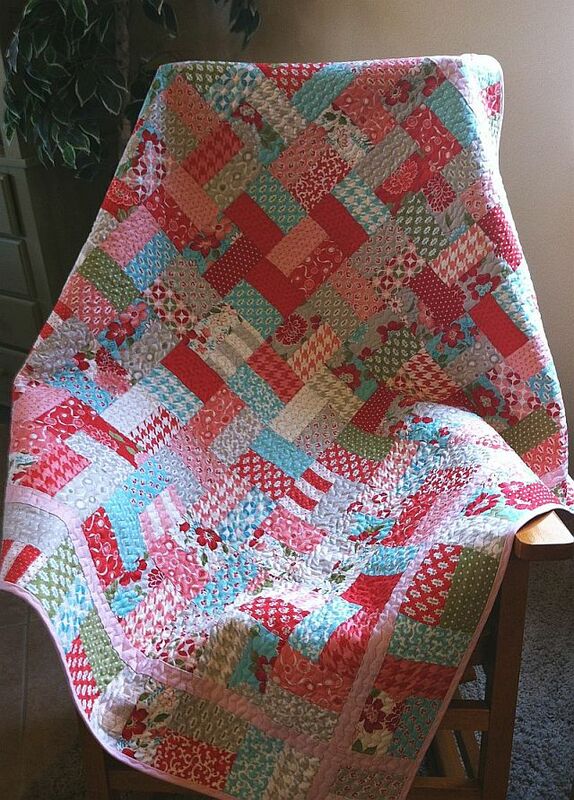 Kathie asked if it was ok to use a Layer Cake to make the quilt larger. 1. Use one layer cake of print/color fabric and one layer cake of background. 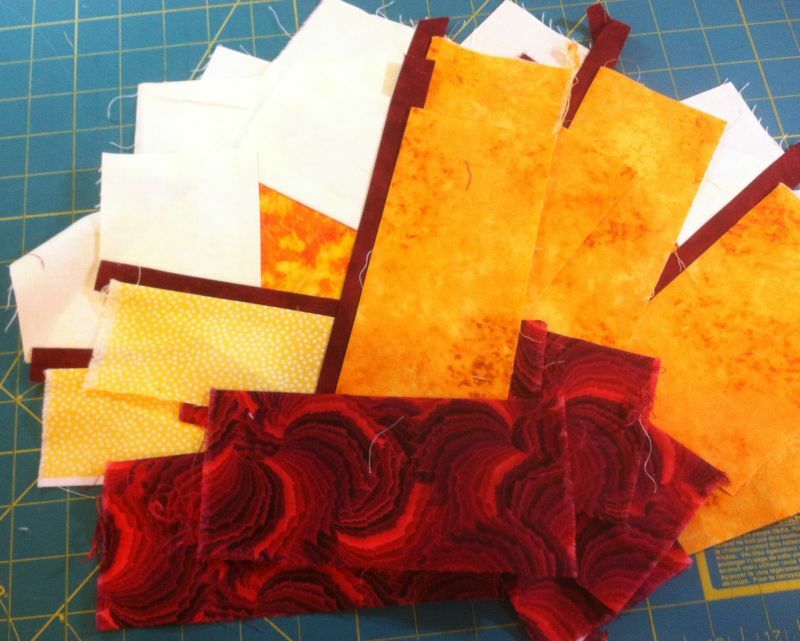 Cut each piece into four – 5″ squares, yielding 168 per layer cake. This is twice as many squares as I have listed for my pattern (mine calls for 2 charm packs of print, 2 packs of background or about 1/2 a layer cake’s worth each). 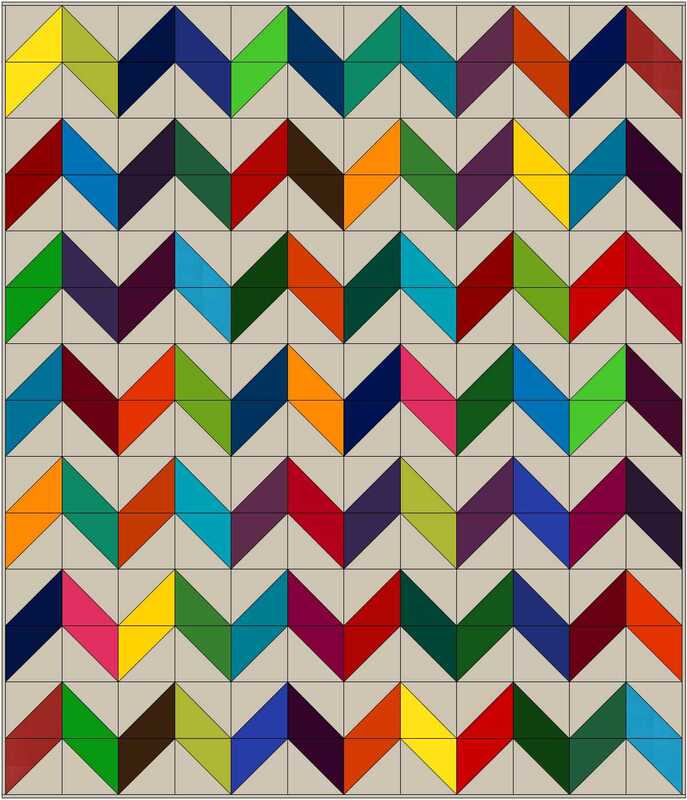 This will make a larger quilt measuring 64″ x 80″. 2. Still use a total of 2 Layer Cakes, but treat each one as an oversized charm square and follow the same pattern, making adjustments for the size of the blocks. This will still yield a larger quilt but with bigger blocks, rather than more smaller blocks as in answer number 1 above. It would measure about 72″ x 90″ (less waste lost to seams yielding bigger blocks). Here’s another way to think of it. If you can find a layer cake with an even amount of light/dark pieces, you can get 2 of the same layer cake. Then separate the lights from the darks and treat them as two separate cakes! Great questions! Keep ’em comin’! 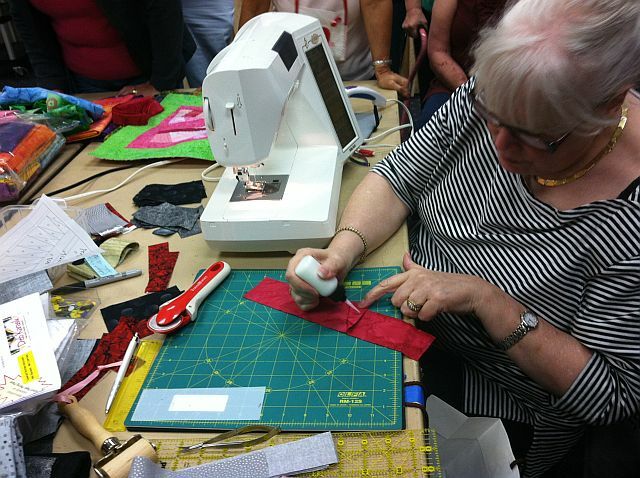 On Friday and Saturday several guild members and I took two fabulous classes from award-winning quilter Deb Karasik. 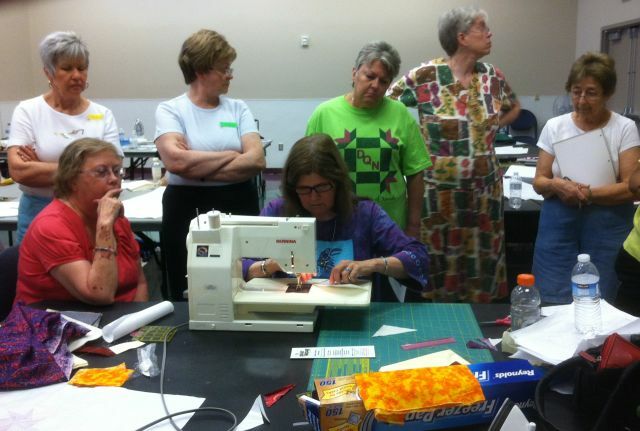 From choosing fabrics to improving my paper piecing and binding skills, the entire weekend was a blast. The best part about it was no traveling! Friday morning I headed off to class with these two stacks of fabric in tow, an assortment of Fossil Ferns from my stash and a stack of Kona Solid fat quarters, along with some grey. For the first quilt, I finished 4 triangle segments which will form the quilt center. I tried to mix in grey with the Fossil Ferns, but as you can see, they just didn’t work well together. I’m going to take the grey out and swap it for either black or white. Or I may remake these blocks with the Kona Solids and grey. For the next quilt, I was feeling more confidant because it didn’t require the use of any backgrounds – just lots of great contrast. I was originally going to use my solid fat quarters but I stuck with the fossil ferns instead. 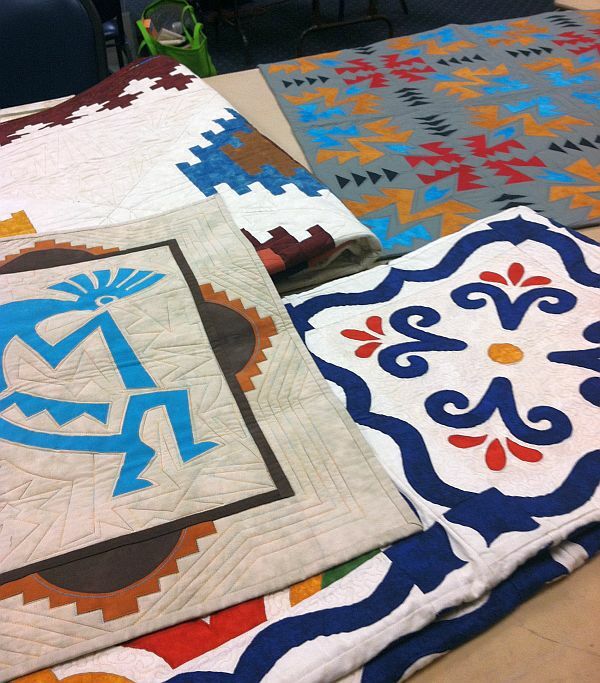 I really wanted to modernize these quilts but I’m not sure the block designs have the right “look” for a modern quilt. That’s ok – it was still a great learning experience anyway! As you can see, we didn’t get a ton of blocks done, but I did learn that starch is my friend and I’m not afraid of paper piecing. 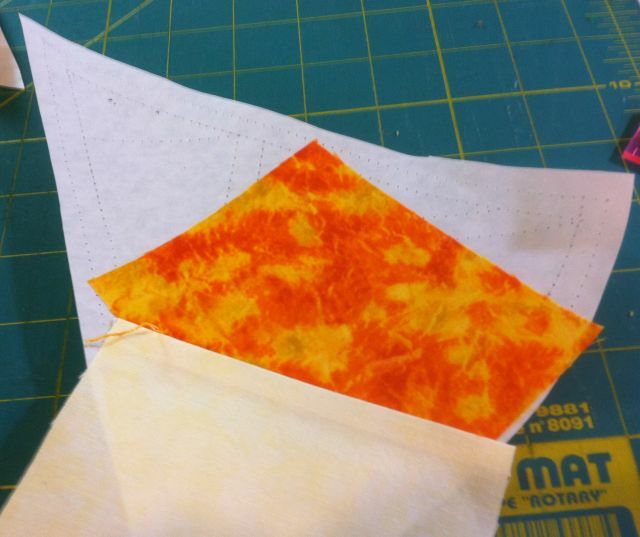 Deb even did a excellent demo about applying binding with glue first before sewing it down. 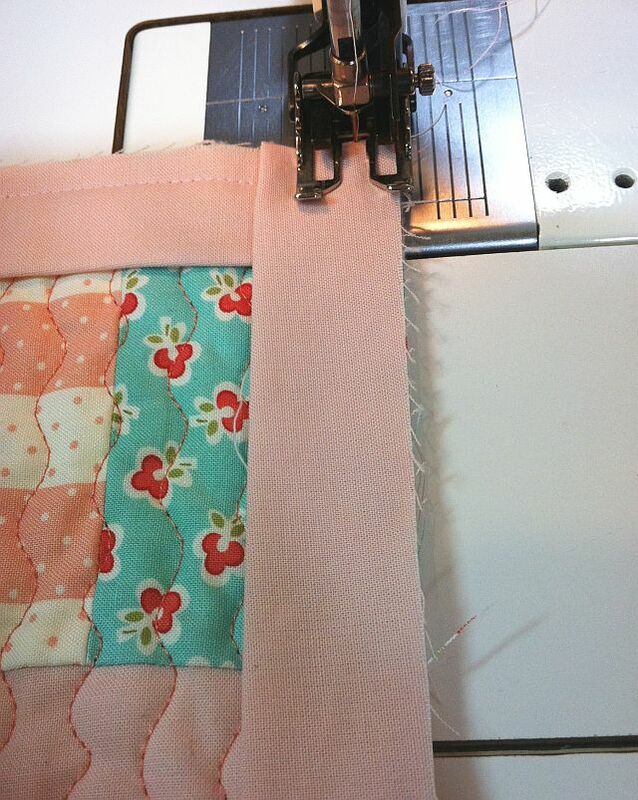 You can see a wonderful binding tutorial on her website. 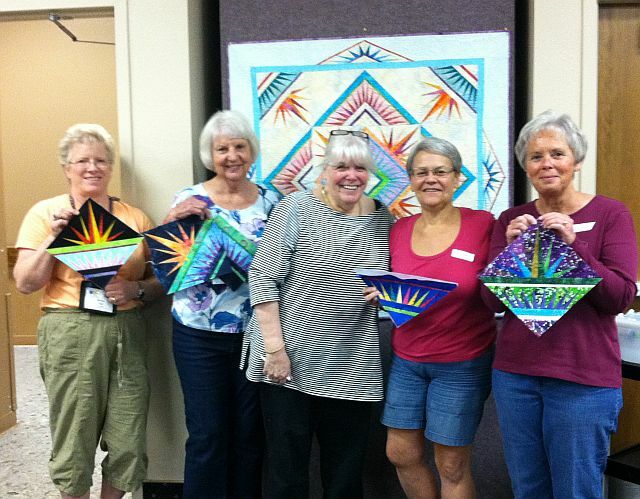 Below is a photo of some fellow quilt guild members with a finished block from Friday’s class. They are standing in front of Deb Karasik’s class sample for the day. And here is a picture from Saturday’s class. I’m the shortest and I get the least done in class, but I still think I have the most fun!! There were about 20 students in each class each day and a few of us took both classes. 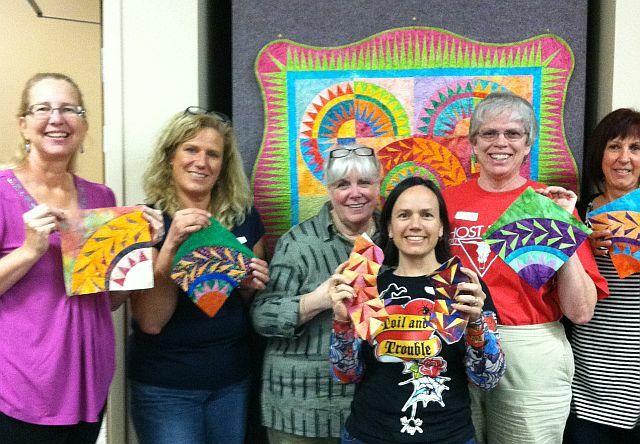 It will be fun to see everyone’s finished quilts! A couple of gals laid their blocks down next to each other just for fun. Don’t they look great? 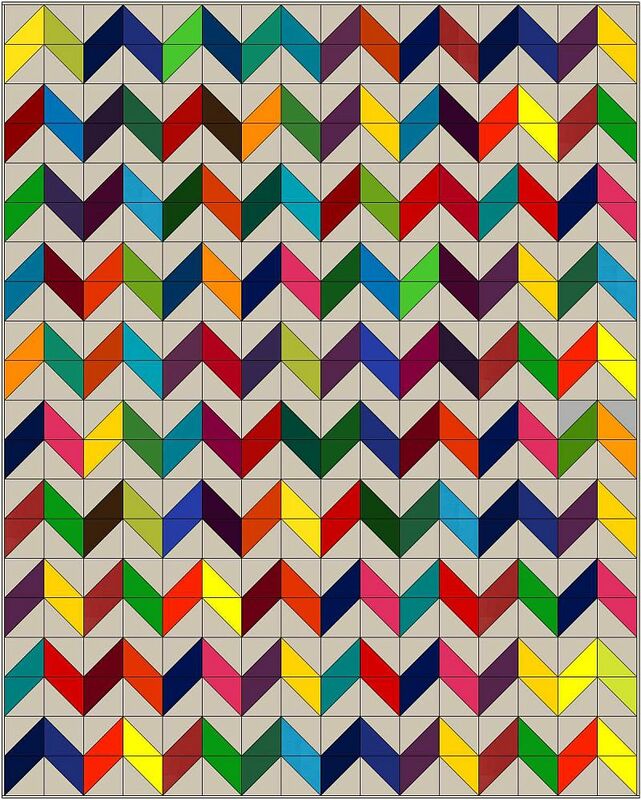 This pattern looks amazing in any colors. Thanks for the great weekend, Deb! 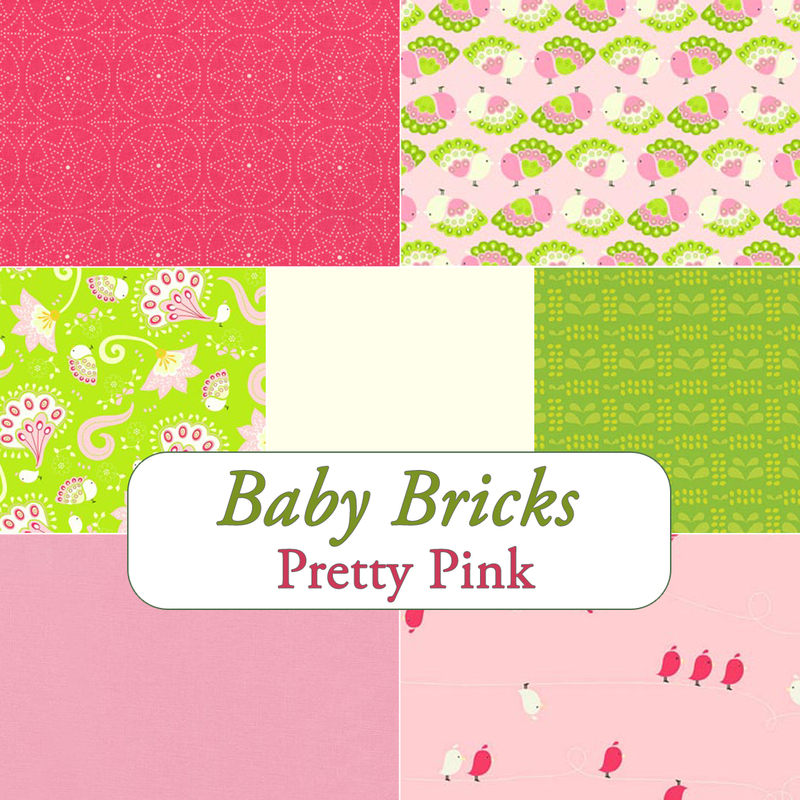 We will be making this Modern Baby Bricks Quilt measuring approximately 44″ x 48″. These colorways are Pretty in Pink and Baby Boy Blue and am going to make one of each! Have fun choose your fabrics using the supply list below and quilt along with me! 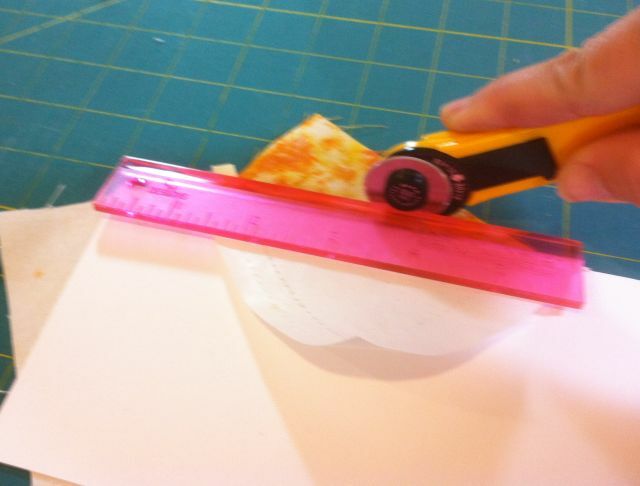 Rotary cutter with a sharp new blade for cutting through multiple layers. General sewing supplies: machine in good working order, rulers, cutting mat, etc. Note about washing your fabrics – I always prewash to make sure there are no surprises. If you are using small pieces like fat quarters, either wash them by hand in your sink, or use a mesh bag and machine wash on a gentle or hand-wash cycle. 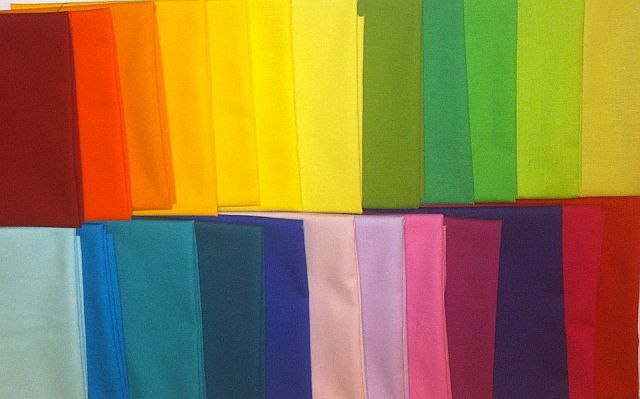 Wash light and dark colors separately until water runs clear and consider using a color catcher sheet with each load. So take this week to gather your supplies and I’ll meet you back here next week for cutting! This week’s post is the one I’ve been waiting for. I think machine quilting is the best part of making a quilt, so I couldn’t wait to get my Vintage Modern jelly roll quilt top finished and basted so I could start the fun! I quilted it using a serpentine stitch with my walking foot. 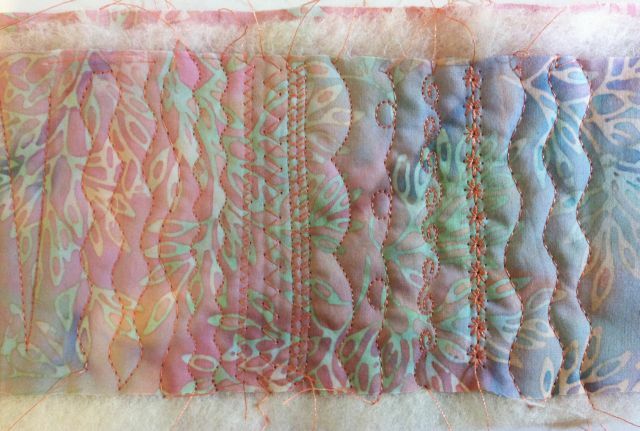 Before I started quilting, I tried out a few of my machine’s decorative stitches to see how they would look. All of these can be done using a walking foot with the feed dogs engaged. 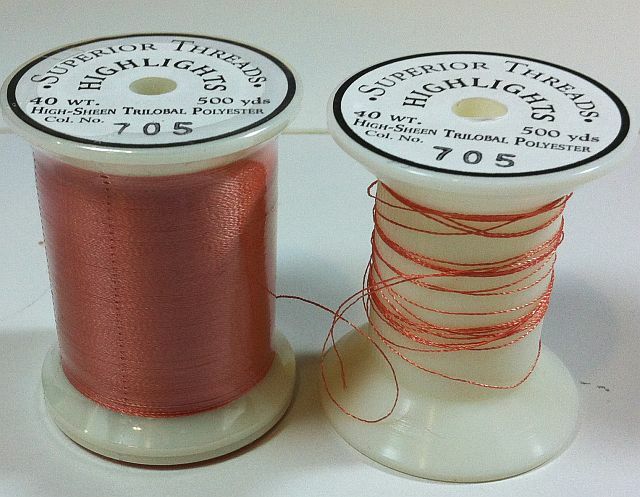 I used a 40 weight high-sheen polyester thread with a size 90 needle and used the same thread for both the top and bobbin. This gives better results than using different colored threads. Be sure your needle plate has a wide enough opening to accommodate your decorative stitch and test it out first so you avoid broken needles. 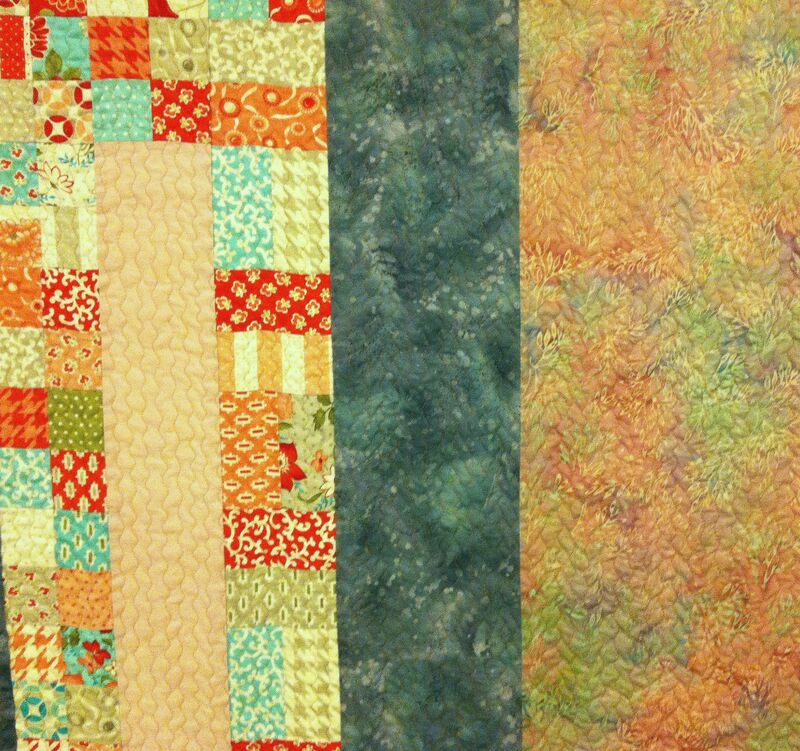 Quilt along the seam lines in one direction in between your blocks, about 4 inches apart. The first pass took me 30 minutes. 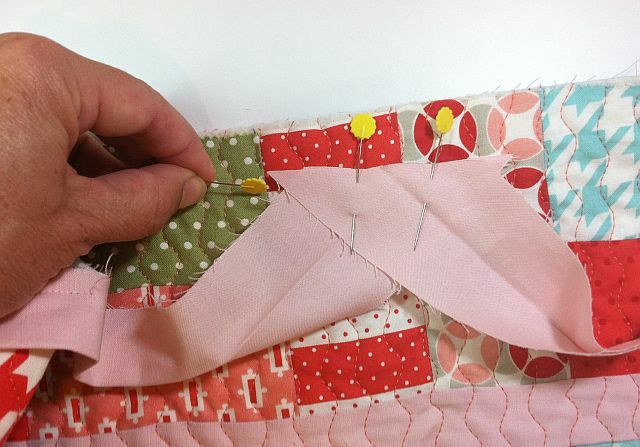 This will secure the quilt and you can remove the pins as you go. 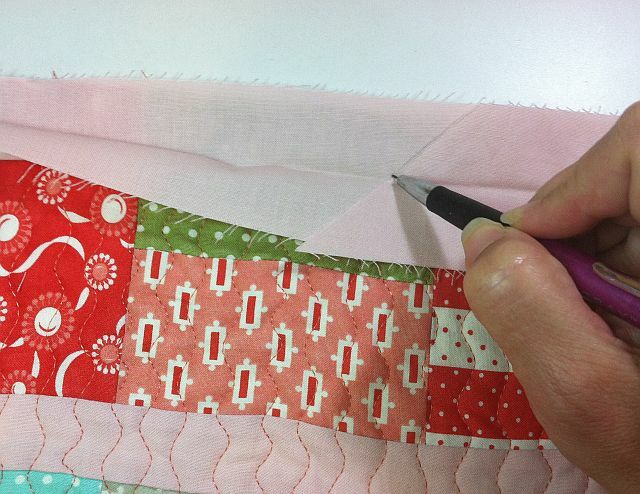 Next, make second pass in between each line of quilting. 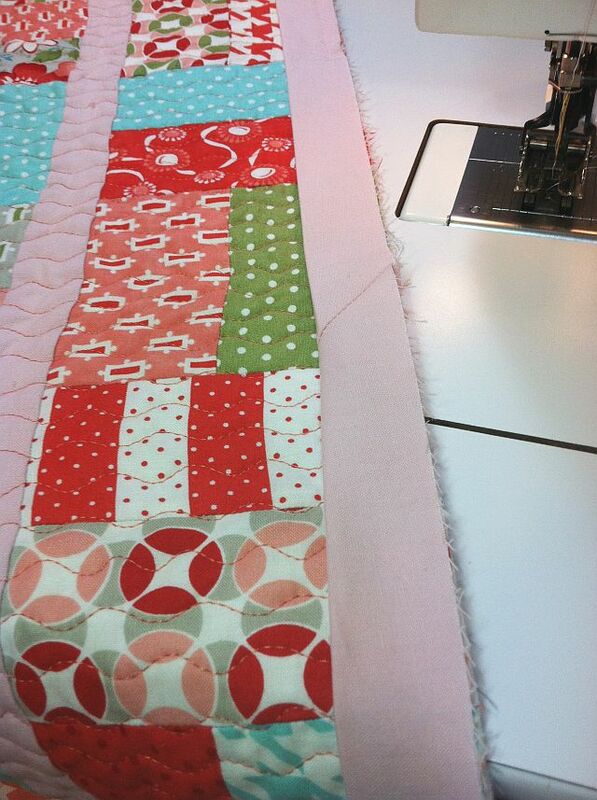 Now your quilting is about 2 inches apart and the quilt is starting to get some texture! 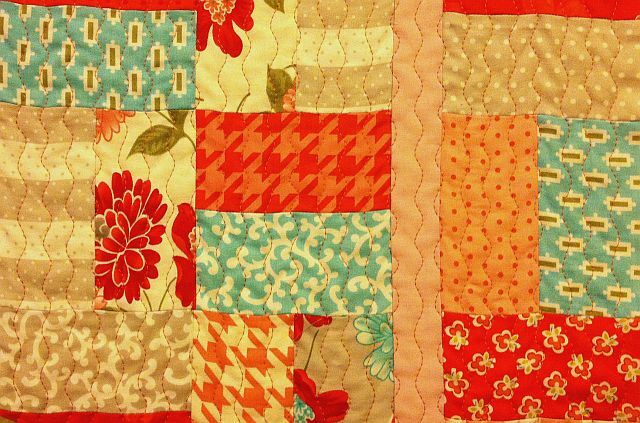 I quilted parallel lines across the quilt. I did not mark any of these lines – I just used the seams as a guide and eyeballed it across the fabric where there was no seam to guide me. This is both liberating and fun! 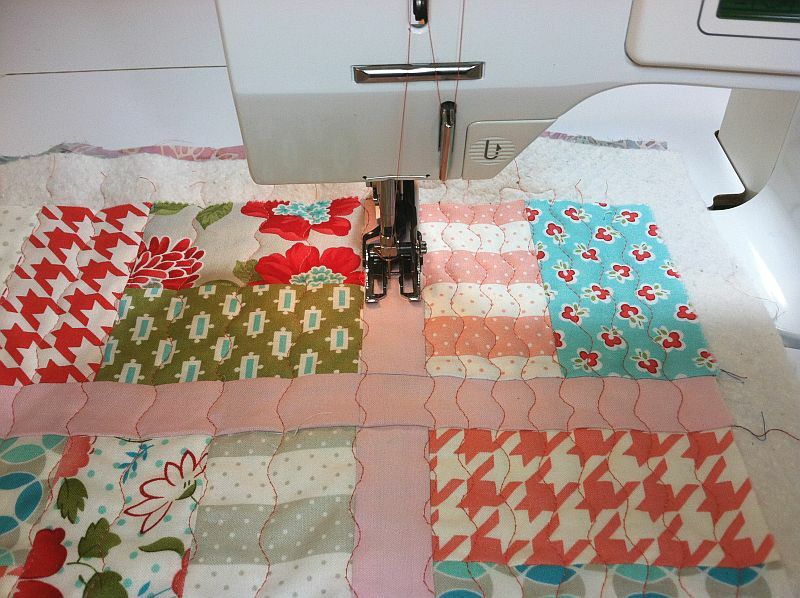 My motto is that you can never add too much quilting to a quilt! So I added another line of quilting in between each of the rows above. 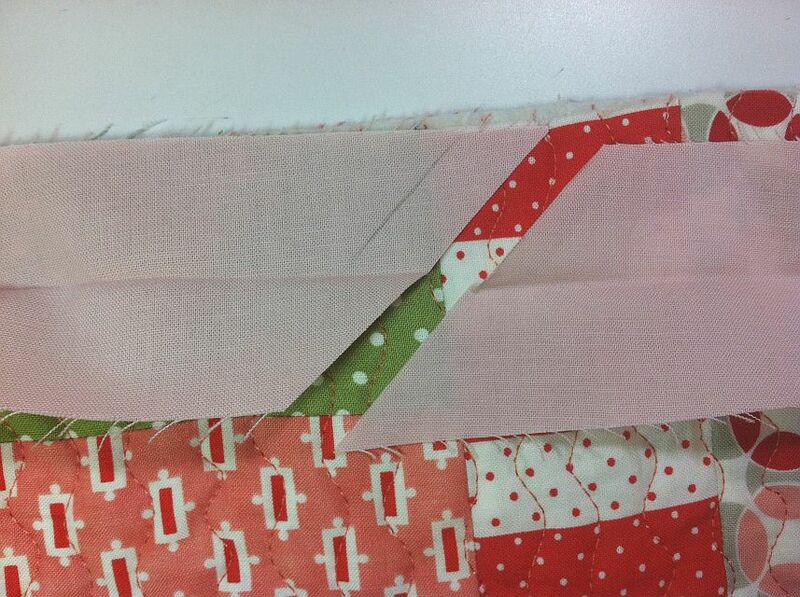 This was my 3rd pass and now the quilting lines are about 1 inch apart. This took only another 30 minutes and I can’t believe how fast this is going! 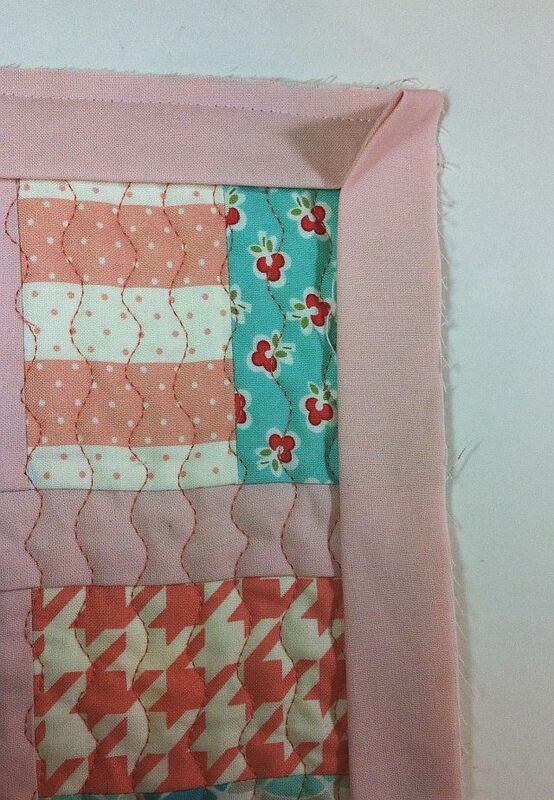 There is still enough room to add another row of quilting and do a fourth pass, so I decided, what the heck? The fourth pass took 1 1/2 hours because I had now doubled the amount of quilting on the quilt, but I loved every minute of it! I ended up with quilting lines about 1/2 inch apart over the surface of the quilt. Total quilting time was 3 hours and I used up a full 500 yard spool of Superior Highlights thread. I love all the texture on the back! 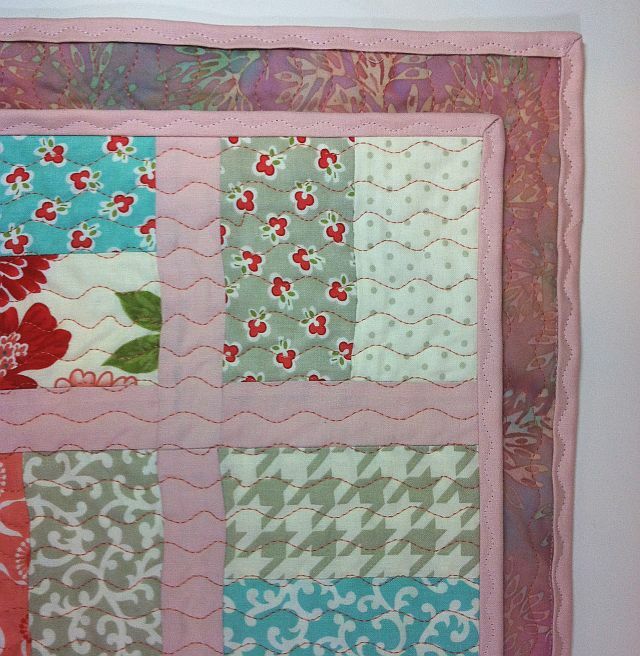 So next week, we will finish our quilts, can you believe it? We will trim them up and bind to finish. 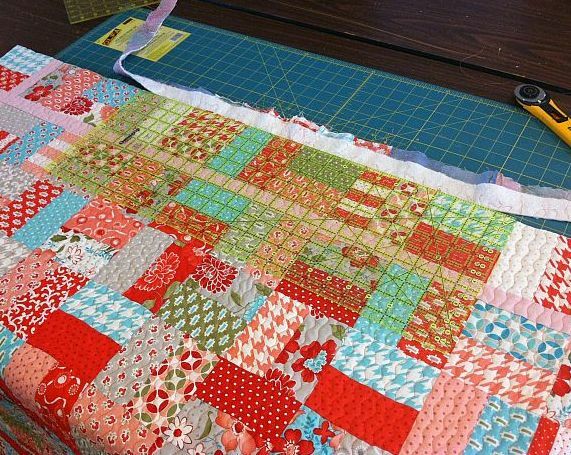 I really can’t wait to see how everyone’s quilting turns out. Be sure to email me pictures of your progress, no matter where you are, so I can share with everyone else. Today’s Sew and Tell is a little different. 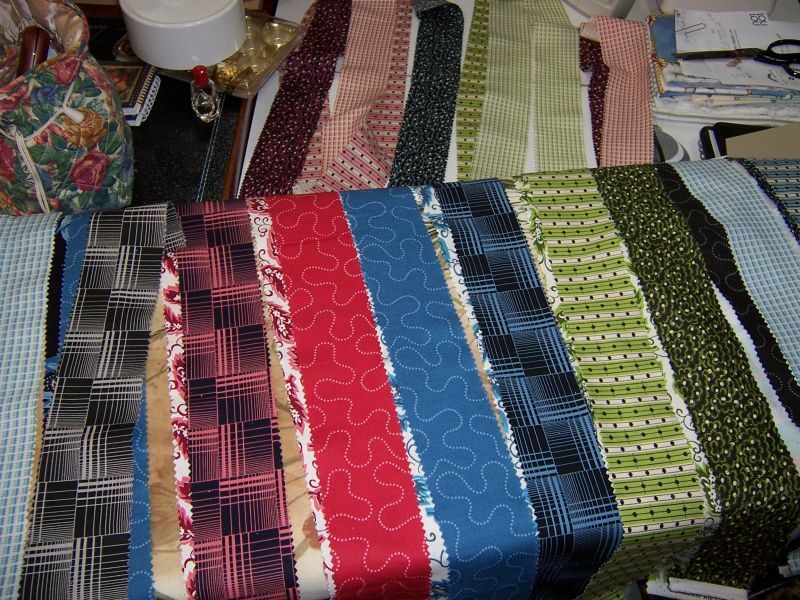 Instead of featuring a finished project made by one of my customers, I’m excited to share with you some finished jelly roll blocks from one of my quilt- along followers. Scroll down to the end of this post if you want to join the fun! These pictures come from Diane in Canada and she finished up this week’s homework in a jiffy! She had an older strip bundle lying around that she put to good use. 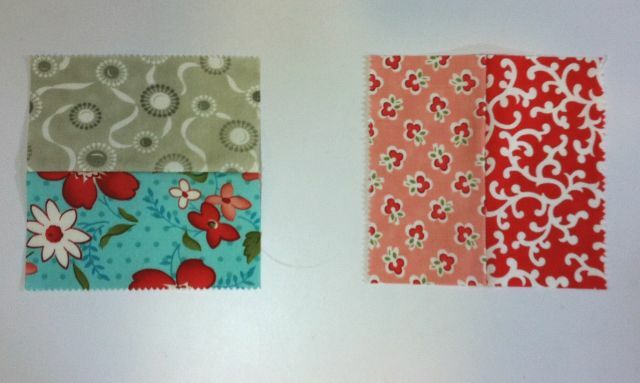 Diane’s fabric is Greenfield Hill by Denise Schmidt for Westminster. 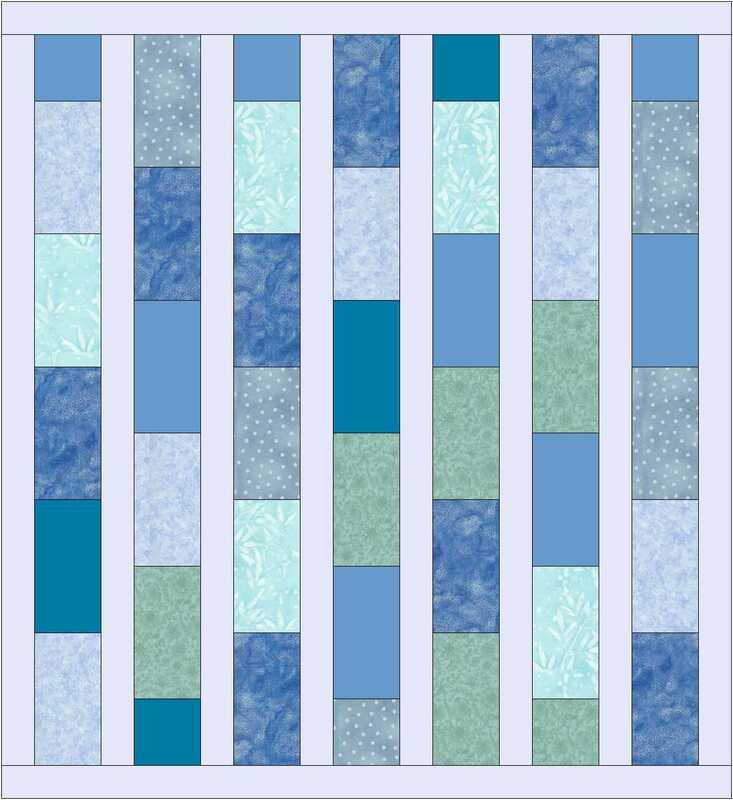 Instead of randomly sewing the strips together, she matched up the pretty jewel tones into coordinating pairs. For those of you eager beavers out there like Diane that are ready to move on, I’ll give a sneak peek of what we’ll be working on for next week’s lesson. 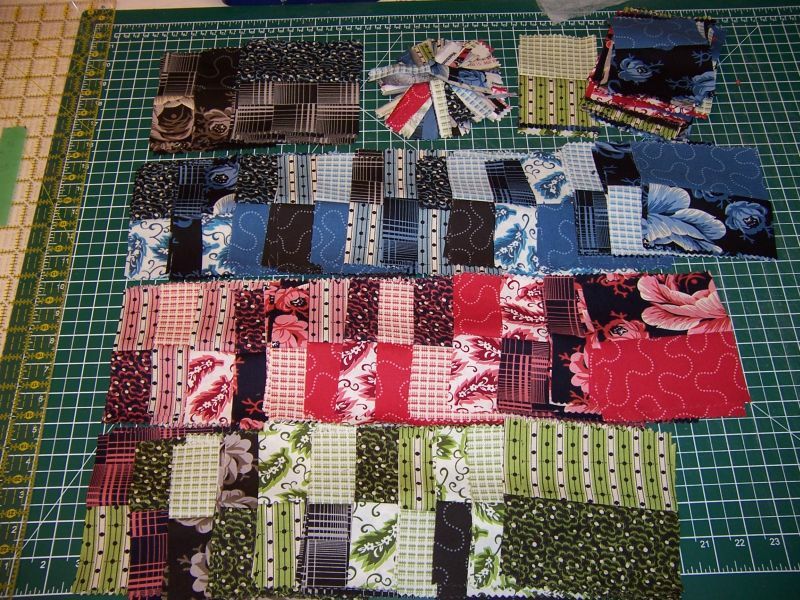 If you select 100 of your blocks and sew them together into 50 pairs like this you’ll be one step ahead. Next week’s post will include complete directions on how to finish the quilt top, so make sure you grab your one yard of tone on tone or solid coordinate to go with your jelly roll. 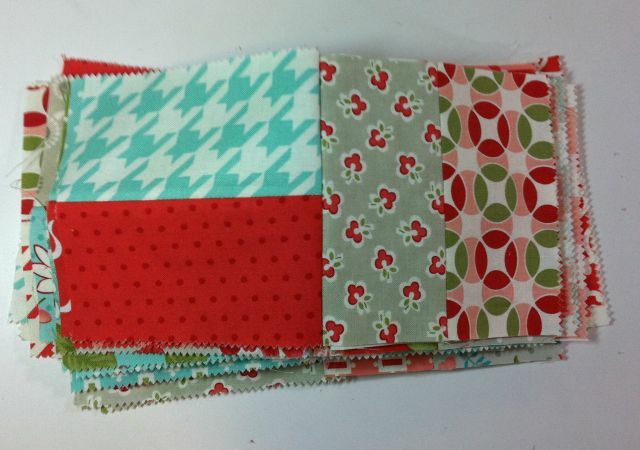 I’m going to use Ruby Red Kona Solid to go along with my Vintage Modern jelly roll shown above. In case you are just joining us, you can click the links below to catch up and follow along with this tutorial in it’s entirety. 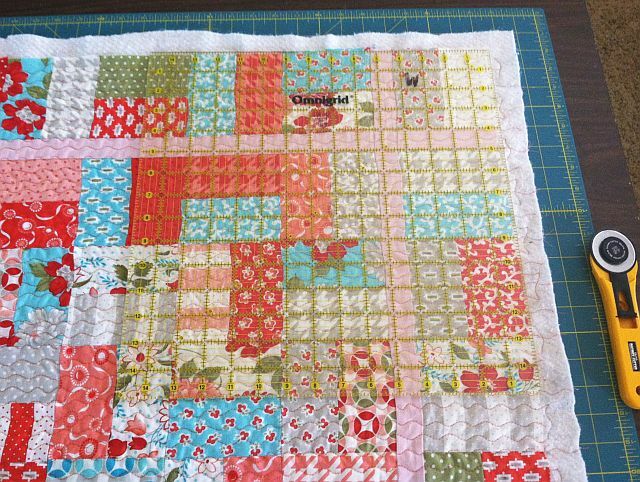 My main reason for starting this tutorial is to teach you that yes, you can, make a complete quilt from start to finish, all by yourself! Do you love precuts but have no idea what to do with them? 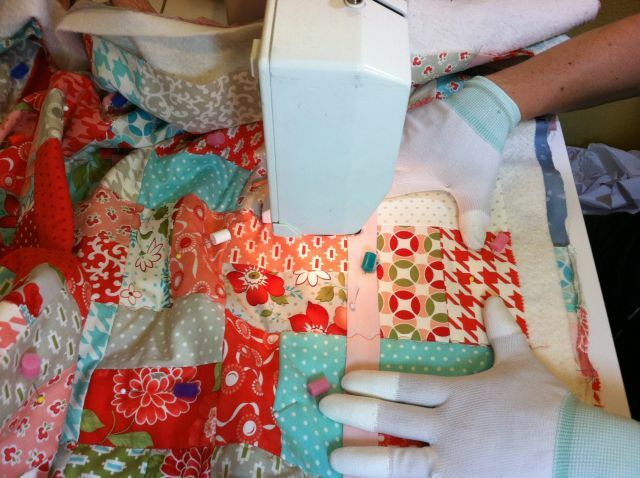 Are you tired of quilting by check and want to make your own quilts from start to finish? 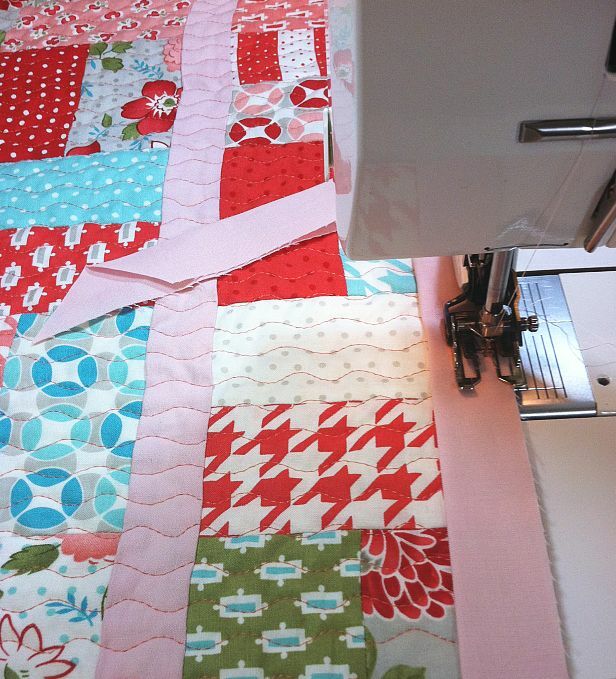 Do basting and binding a quilt scare you? Then come join me for a quilting adventure and I’ll show you how to finish your own quilts yourself, and hopefully help you build the confidence to do so! With my Quilt Along series I will post step-by-step tutorials showing you exactly how to make a quilt from beginning to end. 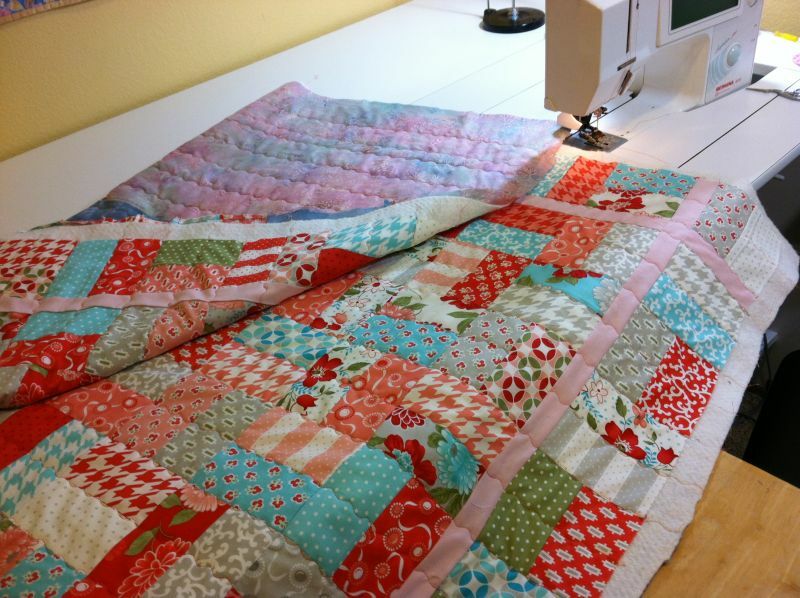 My first project is this super simple Jolly Jelly Roll quilt. Scroll to the end of this post for the schedule. You can also share it on Instagram with the tag #christaquiltsqal. 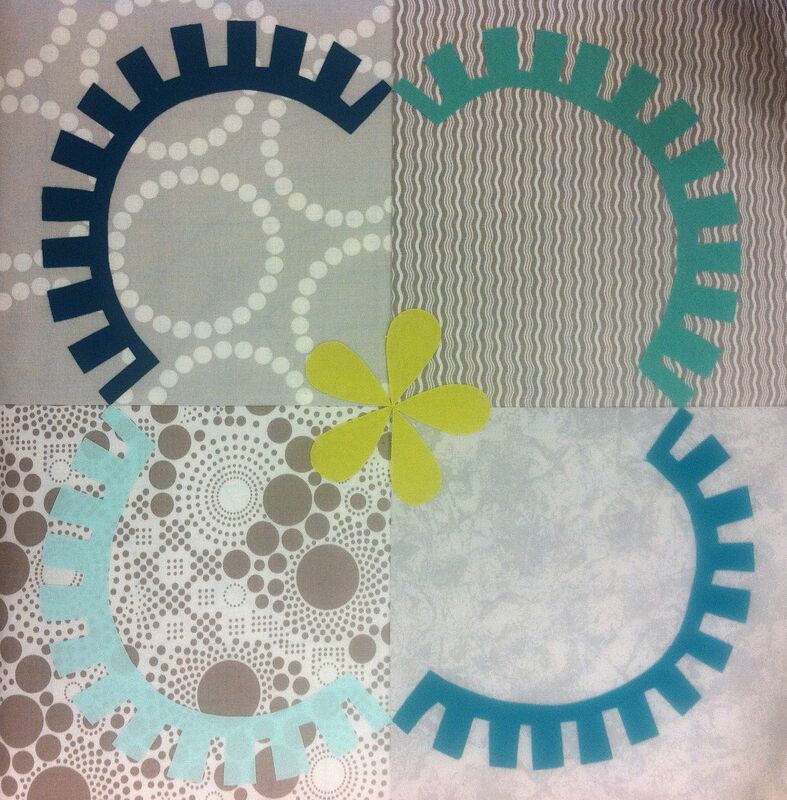 I designed this quilt in EQ7 using fabric swatches Bonnie and Camille’s Vintage Modern collection. However, it will work great with any jelly roll! Let’s get started! Below, I’ve posted a supply list as well as the quilt’s vital statistics and a few notes. General sewing supplies: sewing machine, rotary cutting equipment, pins, seam ripper, etc. 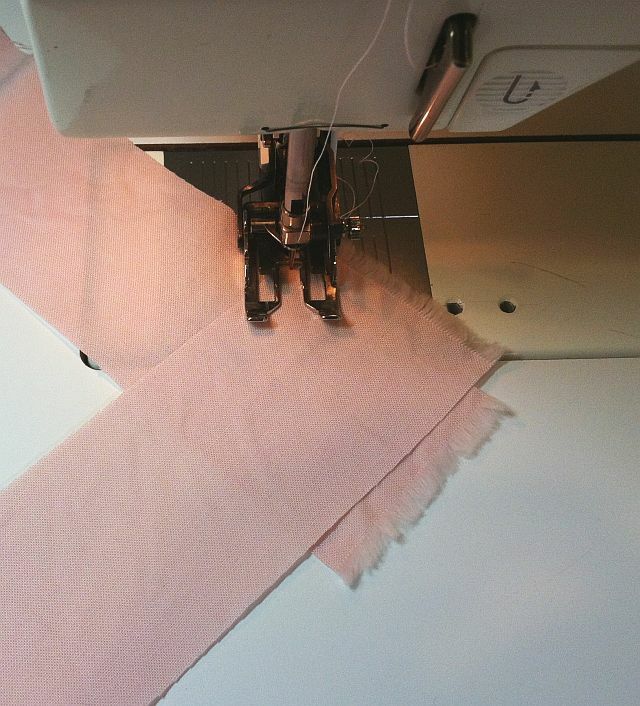 Go gather up your supplies and follow the links below for some fun sewing! 1. 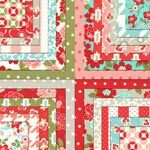 Fabric selection is easy: just choose a jelly roll that you like and pair it with a nice solid fabric, or a tone-on-tone print that “reads” as solid. 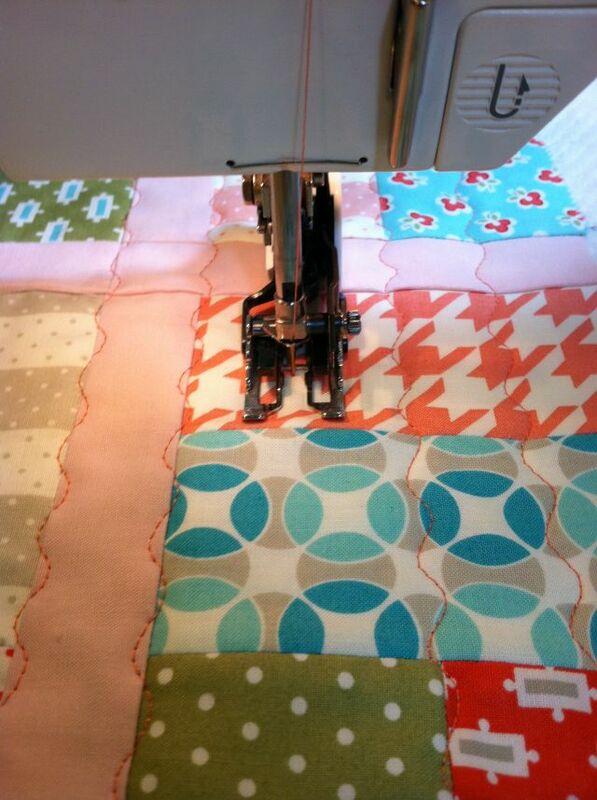 This will help break up the busy-ness of the quilt design. 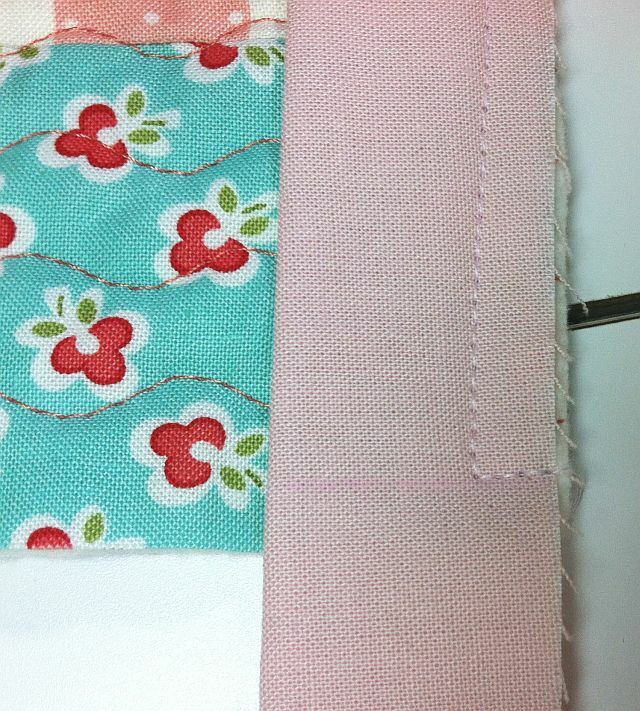 The same fabric will also be used for the binding. 2. 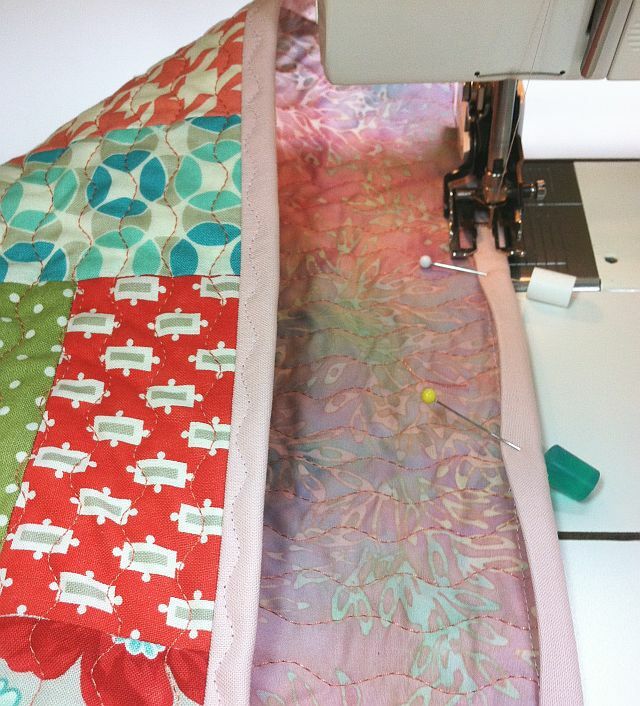 Do not be afraid to machine quilt this quilt yourself. For this pattern, I will be quilting using a walking foot only and leaving my feed dogs engaged as normal. 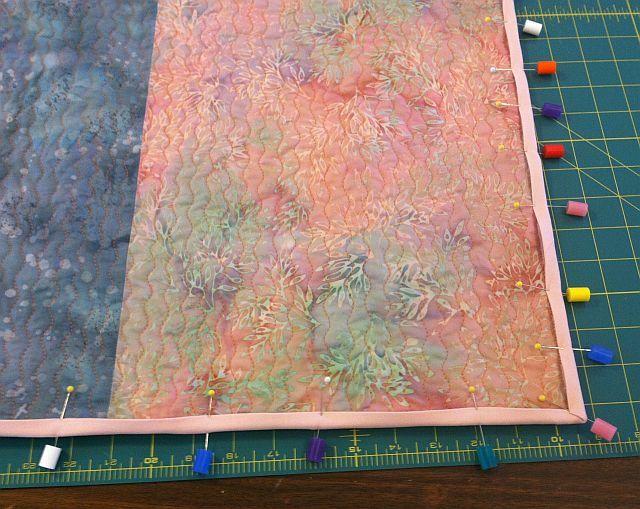 I will not do any free-motion quilting on this quilt; instead I will show you how much lovely texture can be created with either straight stitching or using a decorative stitch on your sewing machine. 3. 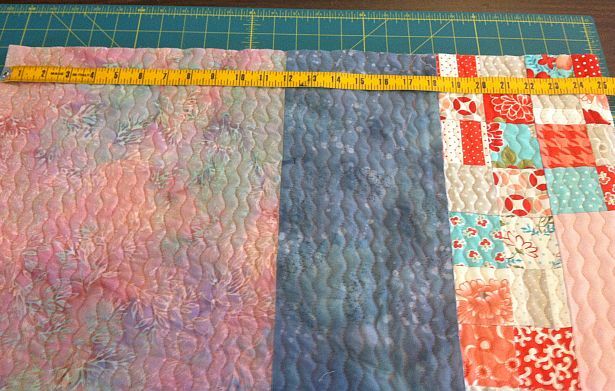 I am very generous when figuring out yardage for my quilts. 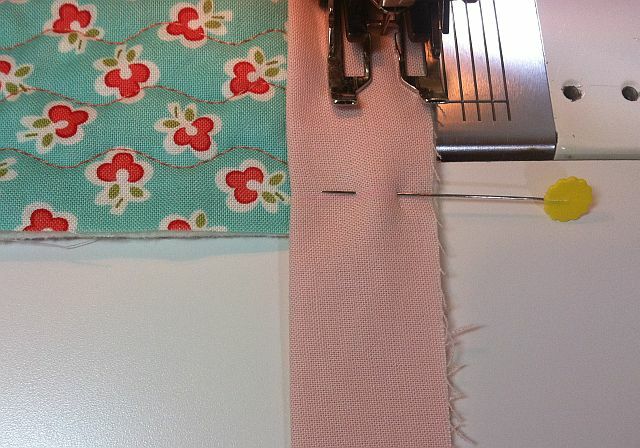 For example, you can probably get away with only 3/4 yard of fabric for the inner border and binding. 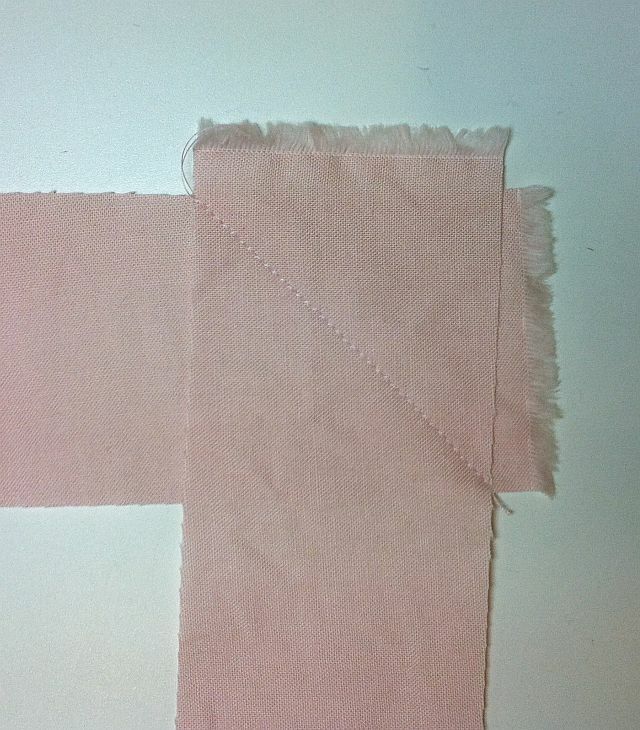 And, with extremely careful measuring or basting, you may be able to get by with just 3 yards for the backing. However, I always round up just in case of fabric shrinkage or mis-cuts. It’s better to be safe than sorry. 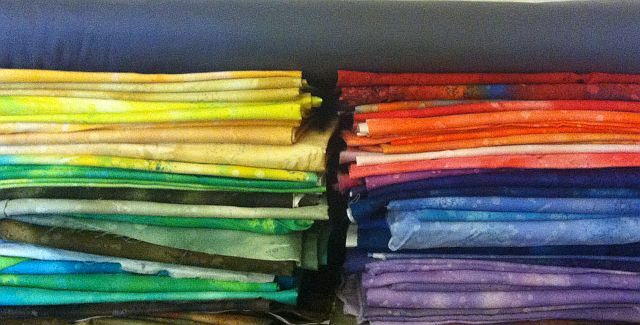 Besides, anything leftover is like “free fabric” for your next quilt! 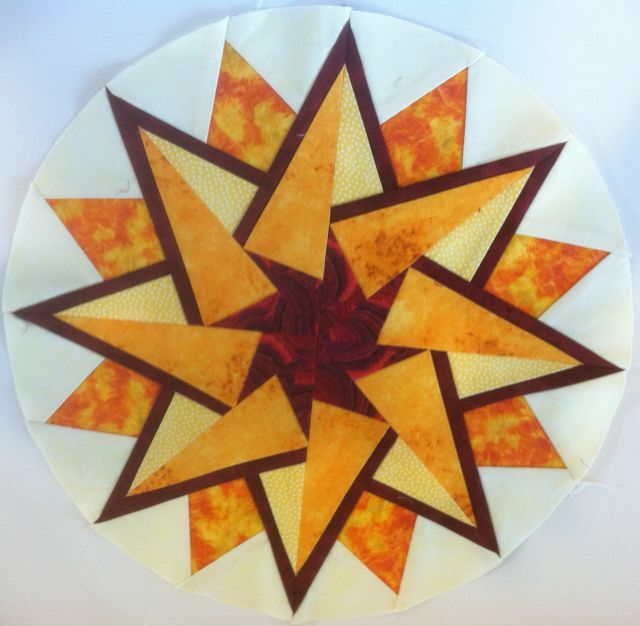 I’m making very slow progress on the Circle Star quilt I started in class with Gail Garber several weeks ago. You can read my previous post about it HERE. 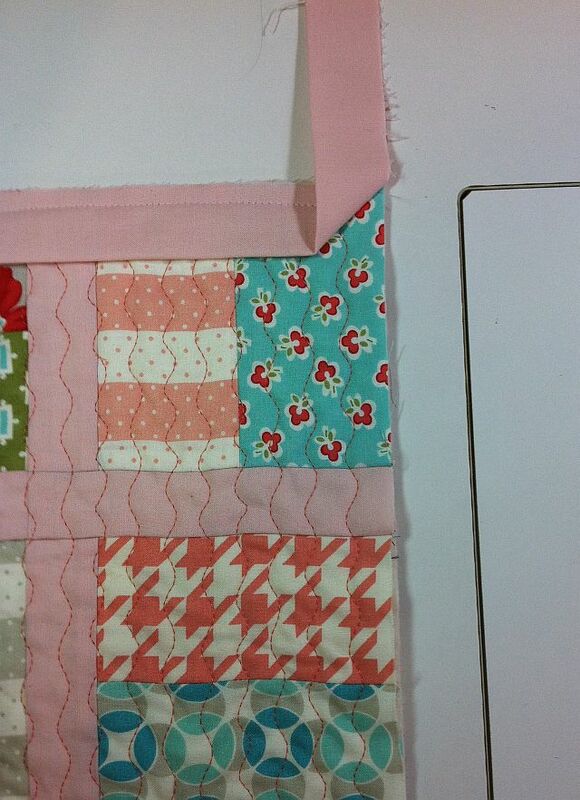 I have finished sewing the block together which is shown below. I absolutely love this block which I designed myself! 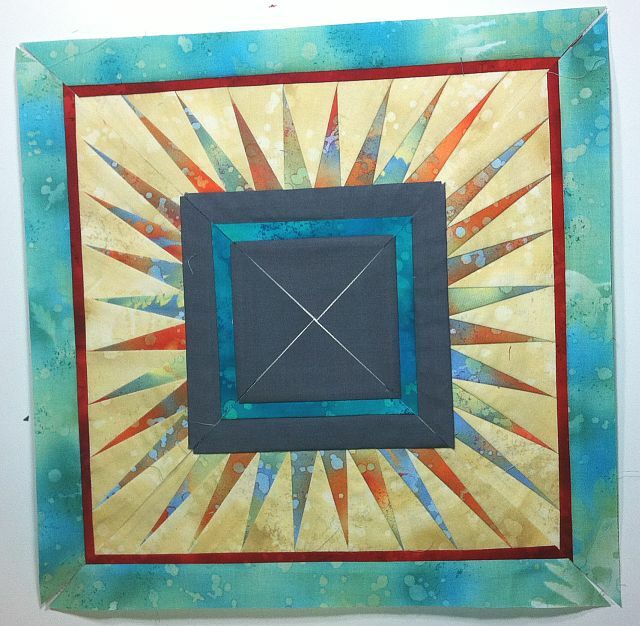 My problem is that I am now ready to move on and design the rest of my quilt around it – but I’m stuck. Do I make more stars? Do I build a medallion around it? The picture below shows one idea that Gail came up with in class. I taped more freezer paper and Gail added some really cool elements to the design. I want to incorporate more points and more borders but I think I need to put this into a design program and really spend some time fiddling. 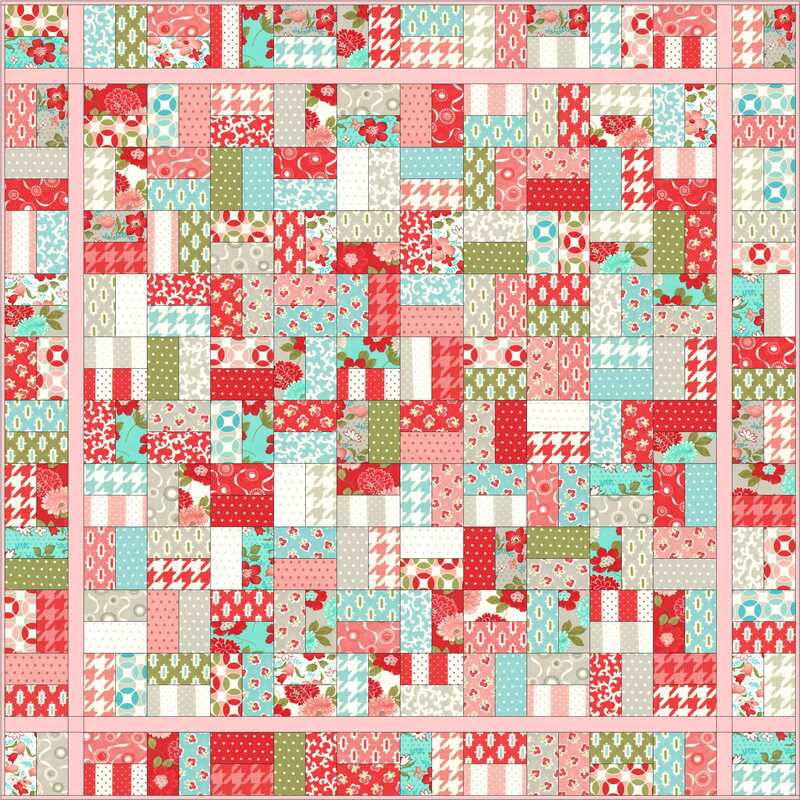 I’ve been playing with EQ7 but that seems more geared toward standard traditional quilts rather than more artistic ones. I’m checking into the feasibility of really learning Adobe Illustrator, too. There’s another program I heard about through Leah Day’s blog called Serif Draw Plus. The hard part is that I know it will take some time to learn to use new tools before I can get back to the fun part – designing and sewing! Oh well – another learning curve to overcome!! Many Circular Star designs are more commonly known as Mariner’s Compass blocks. They look very complicated but are actually quite simple to piece. 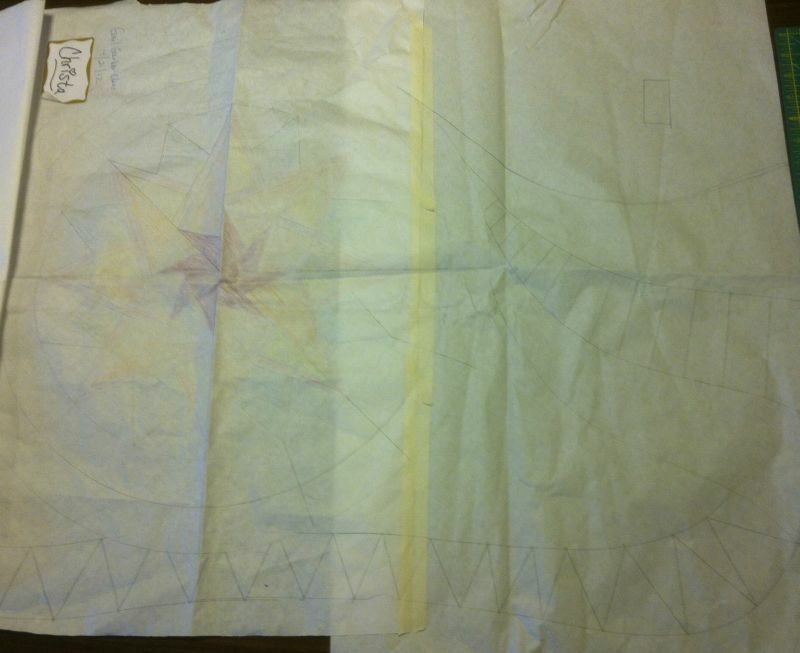 To make my fiery star block that I’m working on this week, I began with a hand-drafted pattern that I learned how to make in a workshop I attended recently from Gail Garber. You can read more about that awesome class HERE. For me, the hardest part was picking out the colors! 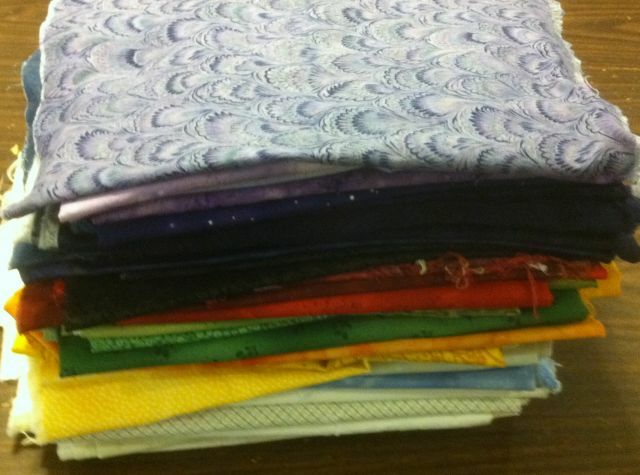 I started out by bringing the whole pile of fabrics shown below to class. It’s hard for me to envision a project until I know exactly what I’m doing. After a day of block designing I was able to narrow down my choices and stick with an analogous color scheme – colors that lie right next to each other on the color wheel. I’ve been learning a little color theory, too. 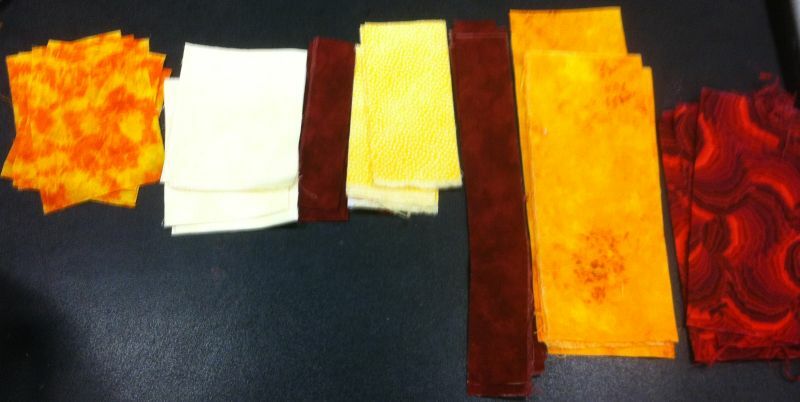 My heart really yearned for reds, oranges, and yellows so I rummaged around in my stash until I was happy with my fabric choices. I needed to make sure there was enough contrast in value to make the design stand out. 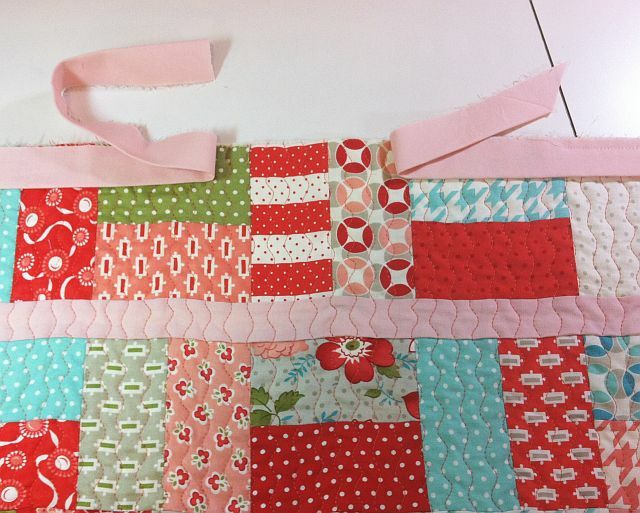 Once the pieces were rough cut into large rectangular patches, the sewing fun could begin! 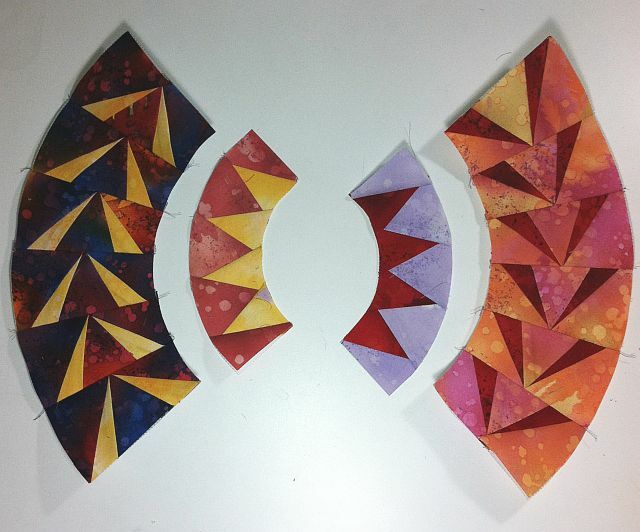 Gail’s method of paper-piecing is to cut each piece out 1″ bigger on all sides. I don’t mind the waste if I can trade it for extreme accuracy. The REALLY nifty part is below. 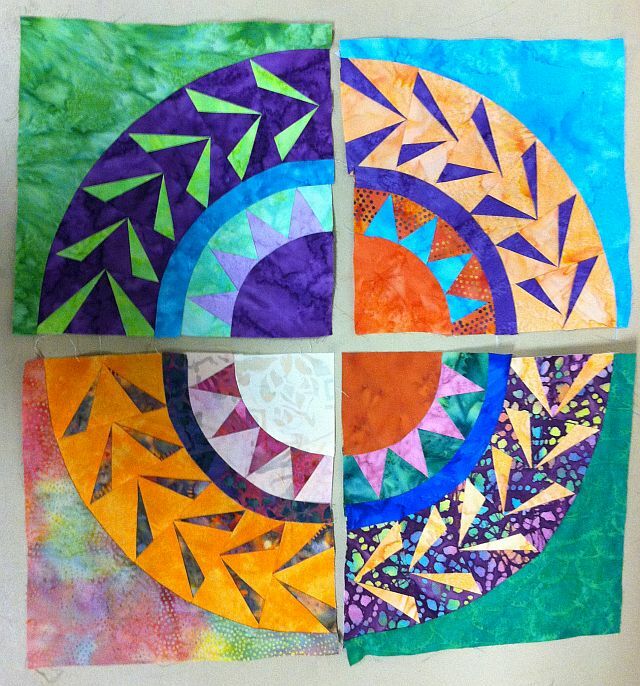 We started off with the first piece in the middle like you normally would for paper piecing. We used freezer paper foundations and made multiple copies by pinning them together and running an unthreaded needle through a stack of freezer paper sheets. 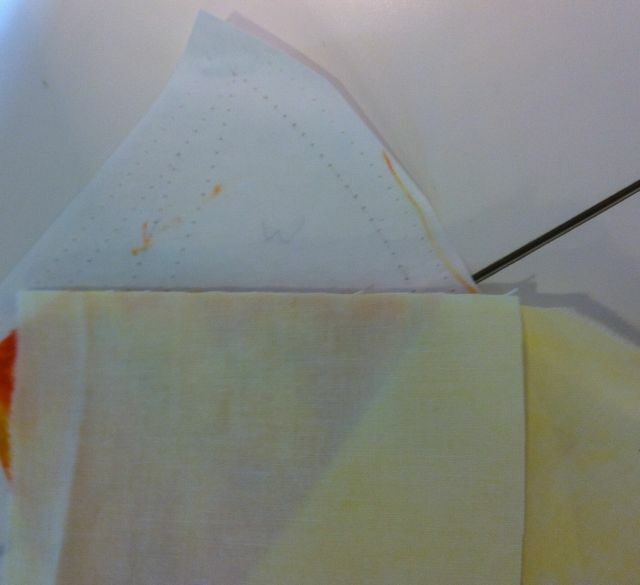 The fabric adhered to the freezer paper when I ironed between seams. That meant no shifting! It easy pulled away when I was ready to add the next piece. 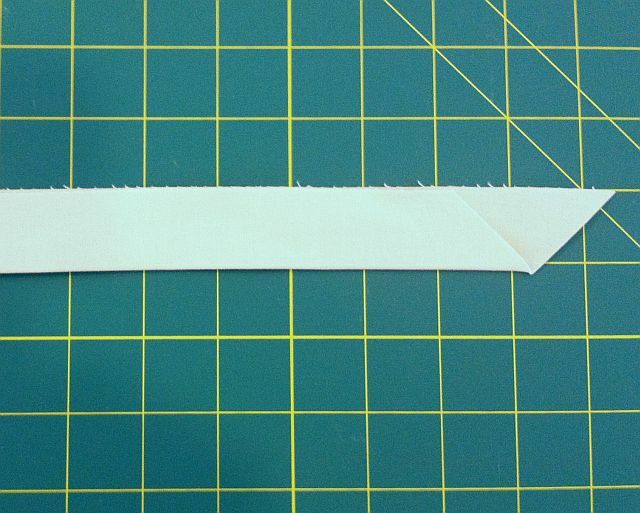 The “magic” happened when we used an add-a-quarter ruler to the edge of each sewn piece to cut off the excess. 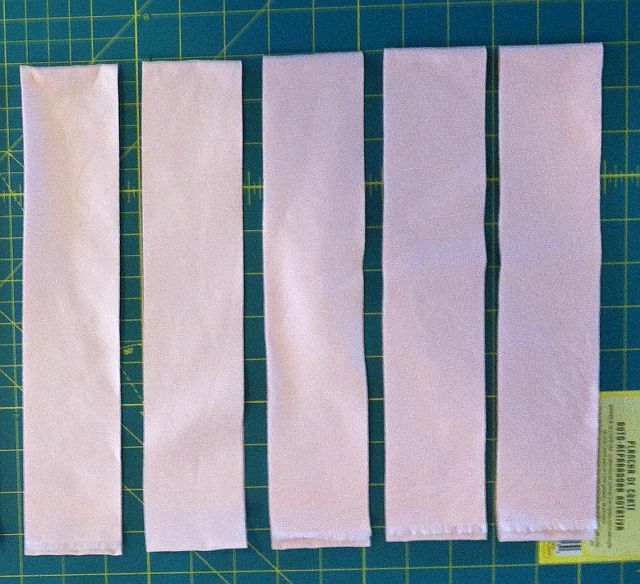 Instead of getting globs of fabric lumps on the back, each seam was nice and tidy. It made lining up the next piece super simple! 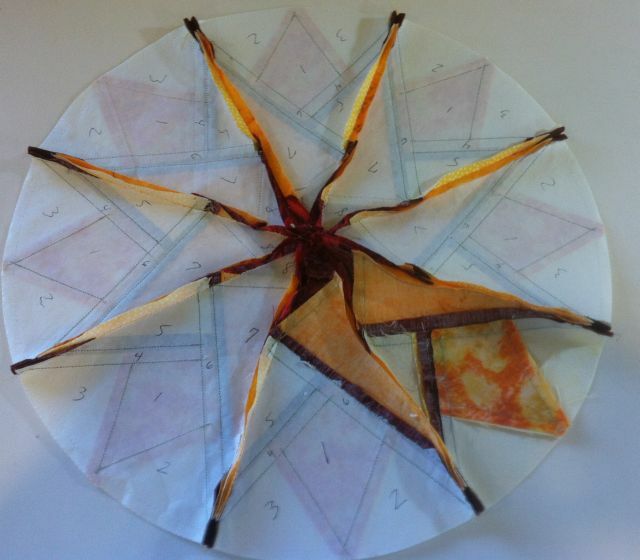 Once I had a stack of pie slices – 8 to be exact, they were ready to be trimmed and sewn into a circle. 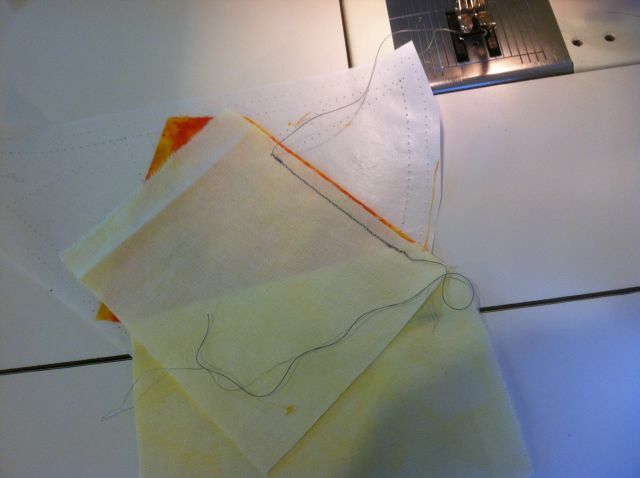 The picture below shows Gail in class demonstrating how to paper piece on my Bernina. The best thing about taking technique classes is that it gives me great ideas for nifty notions that I’ll eventually carry in my store. 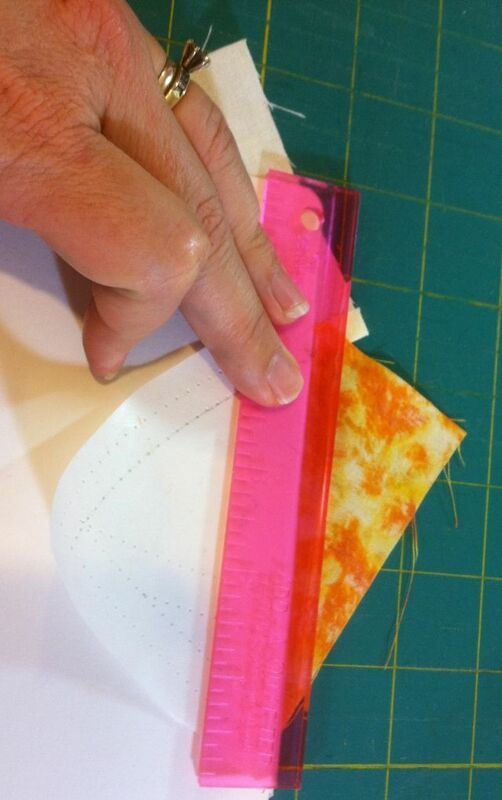 In the meantime, if you are interested in the add-a-quarter ruler and other supplies for paper piecing, you can order them from Gail’s website here: www.GailGarber.com. Now I can’t wait to turn this block into an exciting (perhaps award-winning??) 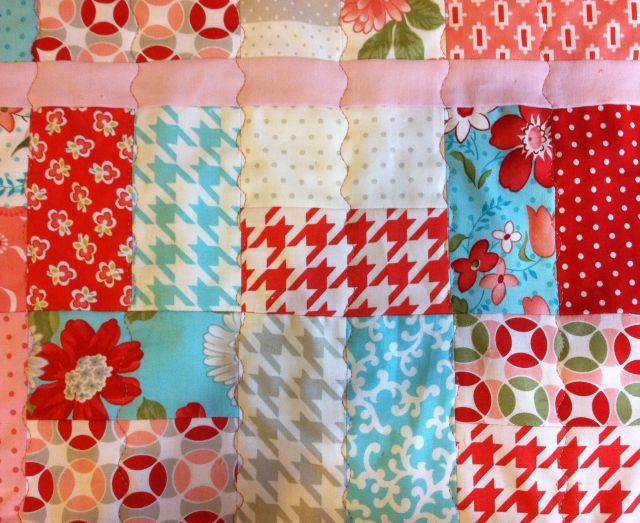 quilt! I will post weekly updates as I work on this project.